"Modern Analog" is our first soundset for The Legend, crafted by expert sound designer Kevin Schroeder. 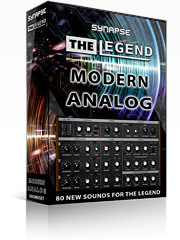 Coming with 80 high-quality, expressive patches, Modern Analog gets the most out of The Legend. the vintage-analog features of The Legend, taking advantage of the Poly mode, extra filter types and effects. 21 Bass, 12 Pads, 13 Leads, 14 Effects, 3 Chords, 4 Bells, 3 Plucked and 10 Drum sounds. Click on the video below for a demonstration of some of the included patches, then get this soundset today! Note: To use this soundbank, you need a full, registered version of The Legend.